These lilabitaheaven spice cookies are perfect with tea, either for breakfast or for an afternoon snack. 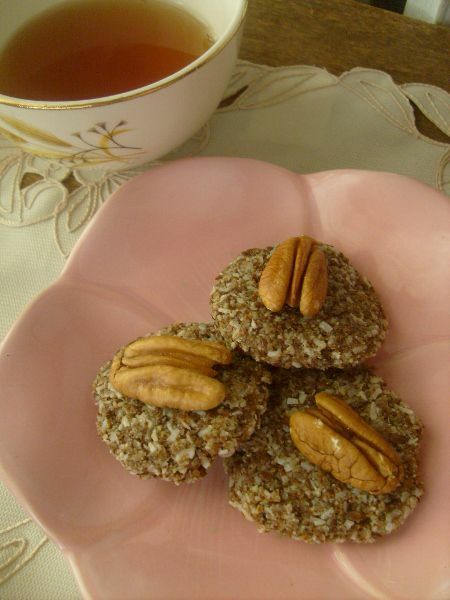 This lilabitaheaven spice cookie raw foods dessert recipe was contributed by Holly Wolfley, St. Louis, MO, USA. Holly is also featured on the Raw Chef's page. "After processing you may also like to add: chopped walnuts, raisins, cacao nibs, Goji berries or any chopped, dried fruit. When they are done you can top them with: raw chocolate/carob sauce. Have fun with them, make a whole platter full of different creations! They're great dipped in "warm cacoa (or carob)" made with almond milk. They are delicious by themselves too! Our favorite way to eat them is to make them into Cookie Dough Balls and eat them without dehydrating. mmmmmmm!" Combine all ingredients in high speed blender or food processor and blend until firm dough forms, may need to scrap sides a few times. Be careful not to let it get hot! Form into cookies or balls using hand or by pressing into a cookie cutter. Eat as is, or dehydrate at 105 degrees 6-24 hours (depending on how moist you like them), flipping several times. Knowing how to dehydrate food is important especially to the raw foodist who wants their food preserved, yet with the essential enzymes intact. The role of a dehydrator in raw food recipes is similar to that of a stove, oven and even microwave in conventional cooking. The dehydrator provides a source of gentle heat to preserve, “bake” and warm up cold, raw foods and give foods a “cooked” taste while still preserving the living enzymes that we eat. In using a food dehydrator, we raw foodists can enjoy living crackers, breads, pancakes and potato chips to name a few. So for those of you who crave the distinctive "crunch" of baked goods while still being raw, a dehydrator is for you. Here are some of the tips and techniques I have learned about how to dehydrate food successfully. I personally feel the inexpensive dehydrators are not the best option. May raw foodists love the Excalibur food dehydrator. This recipe and many others are in my new book, Guide to Raw Superfoods, which is coming out soon in paperback! Available in ebook and Kindle formats. 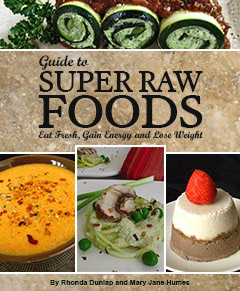 For more information on this informative recipe book, you can go to this page!